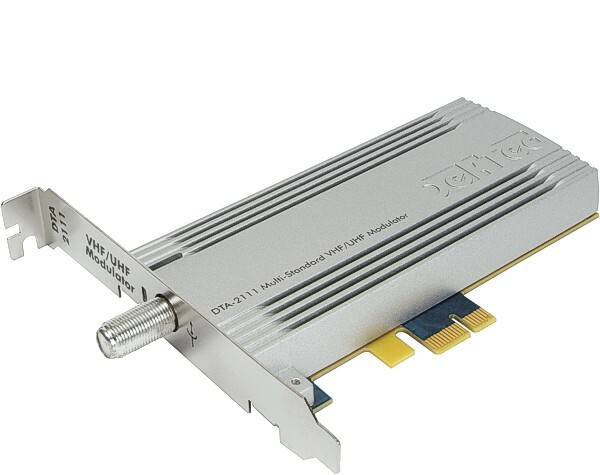 Multi-standard cable/terrestrial modulator for PCIe with StreamXpress player software. Multi-standard cable/terrestrial modulator for PCIe with all current and future modulation options, channel simulation and StreamXpress including remote control. The base version of the DTA-2111 supports the modulation standards listed under "Modulation standards" at the top of this page. Please refer to the Modulation Options page for all available options. Play-back of arbitrary I/Q sample files that are recorded or pre-computed (e.g. with MATLAB), with a bandwidth up to 16-MHz. PCI Express modulator with L-band output for satellite standards DVB-S, DVB-S2 and ISDB-S. If you are looking for satellite modulation, then the DTA-2107 is your best alternative to the DTA-2111. The DTA-2107 is our satellite test modulator with integrated upconverter, that's fully agile over the L-Band. The DTA-2115B is a high-end modulator with high output level (0dBm) and great phase noise figure. Use the DTA-2115B to generate any QAM signal, or even 8 QAM channels with the new 8-channel firmware. A portable variant of the DTA-2111: easy to install and easy to carry to demos and around the lab. Like the DTA-2111, the DTU-315 uses an all-digital modulation and upconversion architecture, with support for L-Band as well. However, as the DTU-315 is bus powered, the DTA-2111 has a better specifications for output level (-9dBm vs -25dBm).